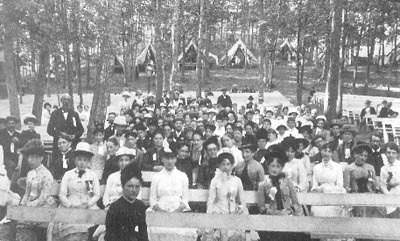 In 1874, two Methodist ministers founded the New England Branch of Chautauqua at Mount Wayte. Families could come for a few days (ten-day sessions in the summer) and be instructed on religious and educational matters. Early on, families were lodged in tents. 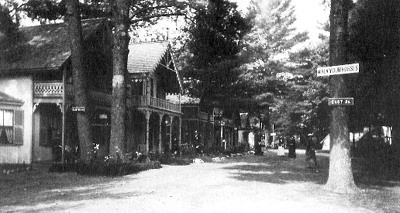 Later, as the center became more established, cottages were built to accommodate them. Victorian cottages at Mount Wayte aligned along what is today known as Mount Wayte Avenue (I think). Some of those cottages are still standing today. Thanks to Images of America, Framingham. Rows and rows of benches in front of the auditorium where lectures were given. Family tents can be seen in the background. Thanks to Images of America, Framingham. 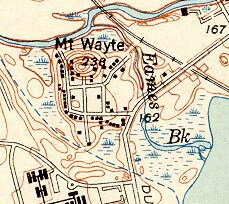 Mount Wayte ca 1951. Thanks to USGS. 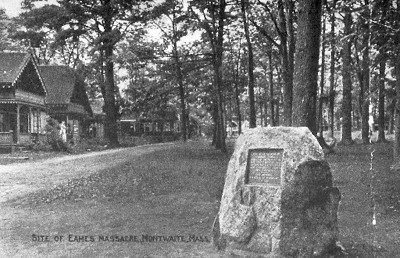 Thomas Eames, an early Framingham settler, had his homestead at Mount Wayte. In 1676, his family was slain by Indians while he was away in Boston. The boulder commemorates that event. Notice the Victorian cottages of Chautauqua on the right. Mount Wayte today. Right is the Framingham recycling center. The Eames boulder is located at the Eastern end of the park delimited by Mount Wayte, Oriole and Chautauqua Avenues. Thanks to googlemaps. 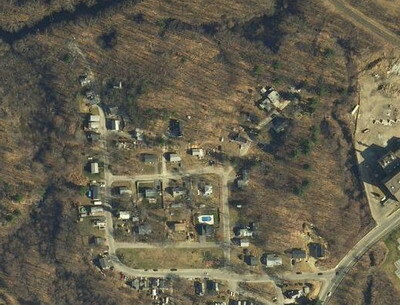 The "Historic Framingham" blog would like to thank the Framingham Historical Society for all they do to preserve the town's rich history, Stephen Herring for his wonderful history books on Framingham (and the Metrowest area) and the technology behind Google Maps which enables people to see where things are and how they look like from (way) above. Feel free to write at historicframingham (at) gmail (dot) com. Thanks in advance.